Surely this machine needs no introduction. 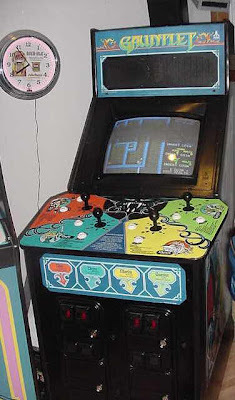 Surely, out of all the classic arcade games I could choose to cover, this behemoth of a machine had such a fearsome presence compared to all those standard machines that were the staple of an 80s video arcade, and such clear audio that, apart from the death scream of Space Harrier that was as regular a sound as you could get back then, everyone noticed the sampled speech, awesome sound effects and (rare) incidental music almost before they saw the huge 4-player simultaneous-supporting cabinet with impressive looking marquee and huge screen. 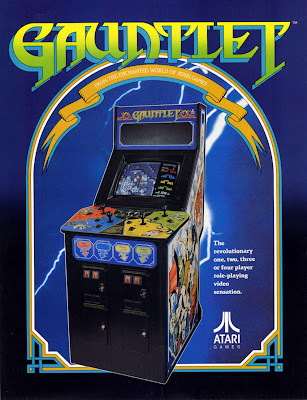 In fact, Gauntlet was such a knockout of an arcade cabinet, it very often got the much-desired position of being the first machine you see when you come through the door. Of course, the option for 4-player simultaneous play was a big pull, but invariably there would be a scramble to choose the best of the characters, or in my case to avoid being the Warrior. 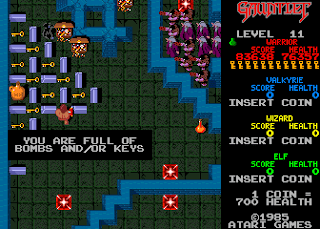 Gauntlet had many “unique” features that seemed quite revolutionary at the time, for example the just mentioned characters that were all different. Most two player games (see Double Dragon for an example) would have 2 different-looking characters, but they would have the same abilities and move set, often the only difference would be a palette swap of colours. 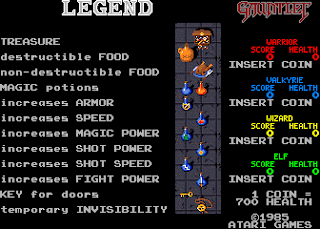 But in Gauntlet, not only did we have actually different characters with different weapons, they also had different statistics, for example Thor the Warrior threw axes, which were the most powerful weapon both thrown and hand to hand, he also had tough skin which would reduce damage by 20%, but unfortunately he was not particularly good with the magic. On the opposite side of the cabinet was Questor the Elf, who had slightly less protection with his leather armour, was much better at magic, but his weedy little arrows weren’t anywhere nearly as powerful as Thor’s axes, however they could fit through small gaps in walls that axes couldn’t. His dagger for hand to hand combat was also pretty poop. And you get the idea. Usually people fought to be the Valkyrie because of her 30% damage reduction thanks to her shield, but it is generally accepted now that the Elf provided the best chance of completing the dungeon. Hold on, I haven’t even mentioned the dungeon yet! The dungeon is an immense series of maps viewed from above, inhabited by all manner of creepy nasties. From your first encounter with a ghost to Death himself, there are several different enemies, who come in different strengths, and most of them will emerge from a “generator” of some sort. Unless you have powerful weaponry, it can take up to 3 shots to kill an enemy, except Death, who can only be killed by magic or by letting him drain up to 200 health. You can also engage in hand-to-hand combat (except with Ghosts), but very rarely escaping without damage. And now I’m going to spoil it all. 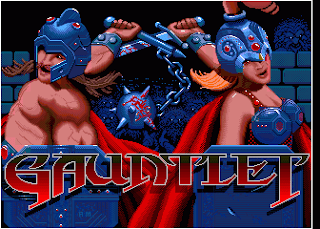 Gauntlet was a great game, a great experience. But unfortunately, it hasn’t stood the test of time for me. The reason is that I have since discovered there is no end to the game. I’ve always believed there to be about 120 levels, but I have now found out that although the first 8 are fixed, the rest of the game draws maps randomly from a store of about 16. The game will, in fact, loop forever after this first 8. Maybe it’s just me, but that’s a sin! 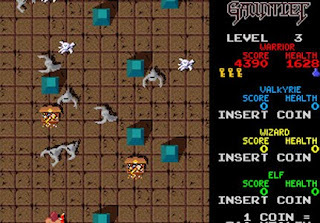 Gauntlet isn’t like Space Invaders, it’s not the type of game you want to play on “Score Attack”, mainly because you can continue to try and get further into the dungeon, but for what? If you’re playing for Score Attack, you’re better starting at the beginning each time. 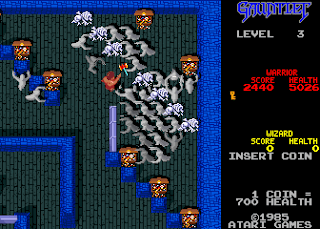 Everybody wanted to “beat” the dungeon, find the end of it, be the person that could joyfully proclaim to be the first true expert of Gauntlet. It almost seems like a fraud to have no end to it. Maybe the worst part is that I now KNOW there’s no end to it. When I didn’t know, I could at least naively play it thinking “Where’s that magic warp to level 100+”, but now I know there was no such thing. On level 1, you could warp to 4 or 8 if you so desired. I haven’t mentioned the in-game speech (probably some of the best of its kind) yet, but I’m feeling the urge to wrap this review up. In short, then… if you want to play this game, play 1 credit and 1 credit only, preferably with 3 friends. Otherwise, you’re in for a world of repetitive and fruitless dungeon hunting. 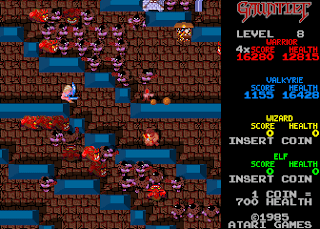 You're right that Gauntlet doesn't end. After you exit Level 999 the next one is Level 8. It took me about 16 hours to observe this. And, yes, I played Questor the Elf, primarily because of his speed. Thanks for the comments QuestingElf. I admire your persistence to discover that! I simply wouldn't have the patience. But that's interesting to know WHERE the "end" is, and what happens when you reach it. I guess I kind of hoped there would be a kill screen, like Pacman/Donkey Kong. Never mind, I'm not too disappointed!